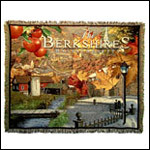 Large woven 100% cotton coverlet with scenes of Boston. Large 48" x 60" design, expertly crafted combines rich color and fine detail. Variously called throws, blankets, afghans, or lap rugs. Fringed on all four sides. Machine washable, color fast, shrink resistant and woven in the USA. 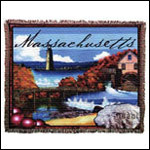 The Boston images on this throw include: Faneuil Hall, the new state house, Quincy Market, Bunker Hill monument, baseball, baked beans, the state bird and flower.